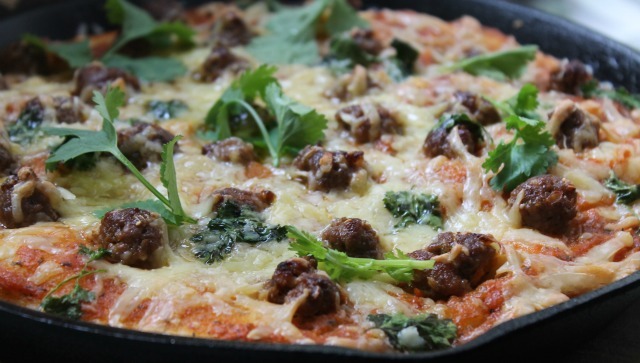 my bare cupboard: Meatball pizza "
From 80 cents small moulds to KitchenAid mixer to Viking range , okay , I'm kidding about that one . But then , who can resist cast iron pan ? Especially if it is cheap ? Hah ! I wish ! I bought a 10 1/2-inch cast iron pan that actually measures 8 1/2-inch at the bottom , 10-inch on top and 10 1/2-inch if you measure it from spout to spout but hey ! , it only cost me $ 52 ! Pale crust aside , the pizza tastes ( of course , I'm the one who made it hee hee ) really good and so easy to make since it's a no-knead dough . For the toppings , anything will do . I've used homemade meatballs ( that I've formed into mini ones ) , homemade sweet and spicy fresh cherry tomato sauce , some grated cheddar , cilantro and olive oil as my toppings . That looks so... good. Yes you did get that crispy crust, I can see. I can make this for my family if not for myself. Hi Anne, wow meat ball pizza, very special menu. I WANT 2 BIG slice, please! im gonna be so much fatter! I want a slice, Anne! All your Italian cooking looks superb. nicey, tiyay! i wanna go to yau ma tei!! Yum... looks very delicious! Never thought of adding meatball in the pizza. Will bookmark your recipe and love to try it one day. Hi Anne! Besides food and wine, I have a weakness for kitchenware and gadgets too! Nice looking pizza! I love your first pic! They look absolutely to die for! 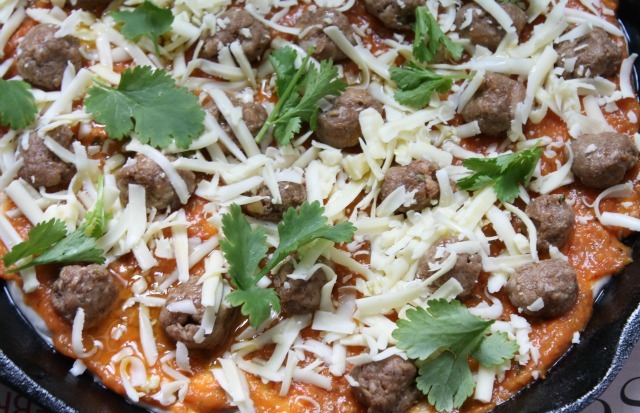 Your meatball pizza looks amazing! The hubby would love this for dinner...and so would I. I eye those Staub pots and pans, too...aren't they beautiful? Your pizza looks wonderful. What a great bargain at the Shanghai St. Too bad a cast iron pan is too heavy for me to bring back to the States. :P Otherwise, I would go crazy on these pans! That sounds really delicious! Yum! wow, looks seriously good! I would like four please! One for each of us in my family, a pizza this good, it would be silly to share! Looks so delicious! Cast iron pan has been on my list for ages and ages! They are EXTREMELY expensive over here. I'm so jealous over yours! Who could ever resist such a great comfort food! Yummy! I love making homemade pizza and use a pizza stone that comes with our oven. However, for those that like deep dish styles this is perfect. I've never tried this before but look forward to it now. I bet you could even make individual ones in muffin tins. Can't wait to try this. Thanks for sharing! 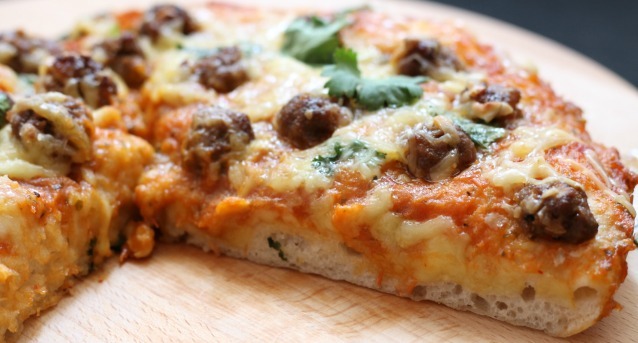 Really love your homemade meatball pizza!! Oh..talking about kitchen toys ..i love them too. 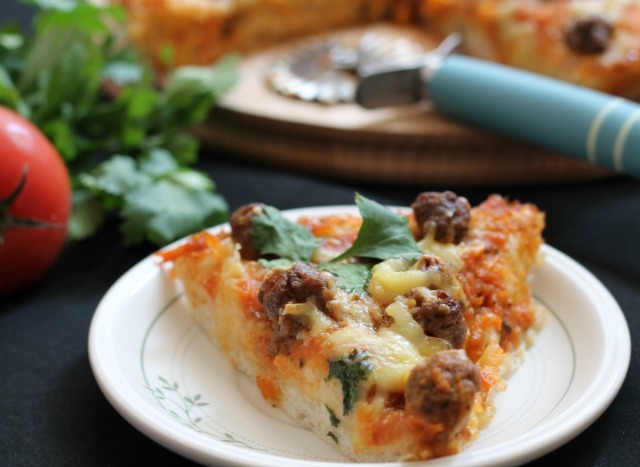 meatballs pizza! i never had one, this looks mouthwatering and one piece will lead to another! i heard abt the shanghai street that sells a lot of kitchen wares, i didnt have enuf time to visit there on my last trip to hkg! Every time when I do shopping , sure drop by kitchen section to see see, eventhough not buying but just like to admire it, hehehe.. What a good dealt , that is cheap and indeed it did a good job, look at your pizza,look so good ! I remember stumbling into Shanghai st two years back when I visited HK... It is indeed a shopping paradise for a cooking woman like me... LOL! We’ve recently launched the website Alldishes.co.uk. It’s a search engine that aims to gather all the best recipes from UK and Irish websites and blogs. We’ve noticed that you have a lot of great looking recipes on your blog that we would love to feature on our site. To read more about how it all works and to sign up with your blog, please visit: http://alldishes.co.uk or send us an email on info@alldishes.co.uk. We look forward to hearing from you! Looks so scrumptious! I love fluffy deep dish pizzas like this!